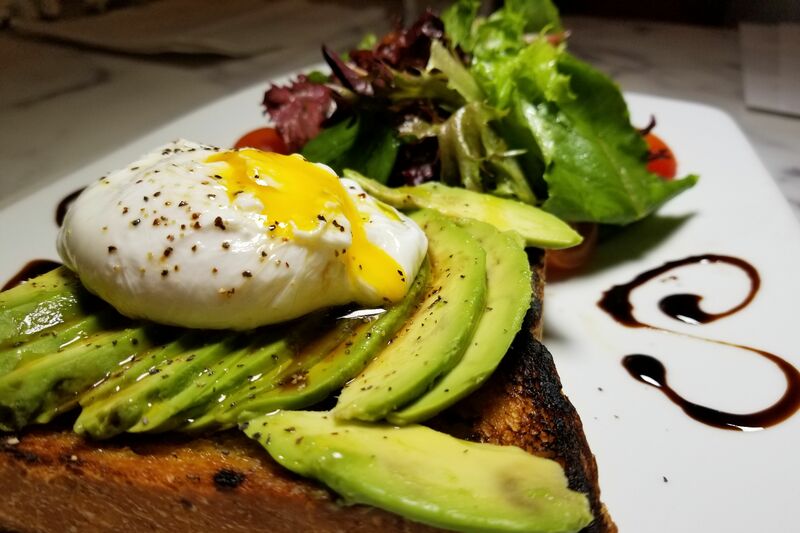 At 10:15 a.m., the kitchen at Italian and Sardinian restaurant Arcodoro in the Galleria area is abuzz with activity prepping for the day’s lunch service. 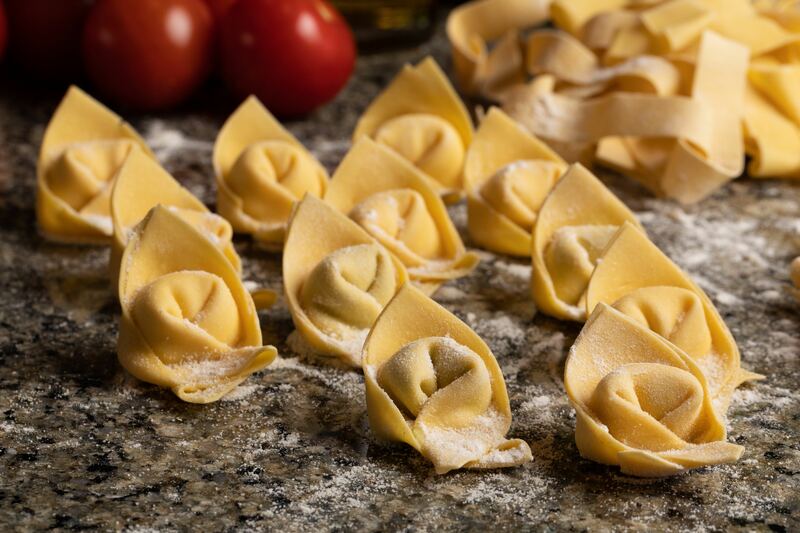 House-made ravioli are being stuffed and cut to the correct size as the day’s fresh focaccia bread is sliced. The smell intertwines with the sounds of the kitchen where English, Spanish and Italian are being spoken almost interchangeably. All heads turn, however, when Arcodoro’s in-house butcher pulls from the cooler a 20-pound, 50-day-old suckling pig that had arrived from a farm in Iowa the day before. It is to be de-boned for the weekend’s special of traditional Sardinian porchetta, or roasted suckling pig. Antonio gets to work, deftly slicing through the belly, removing the ribs and backbone. The hooves and leg bones, later to be used in a stock and demi-glace, are extracted with surgical precision. The process is oddly hypnotizing and about 20 minutes into the 35 minute process, we guiltily start to feel hungry. Efisio Farris, the owner of the 20-year-old restaurant was gracious enough to let us go behind the scenes and experience the process of preparing the special dish. 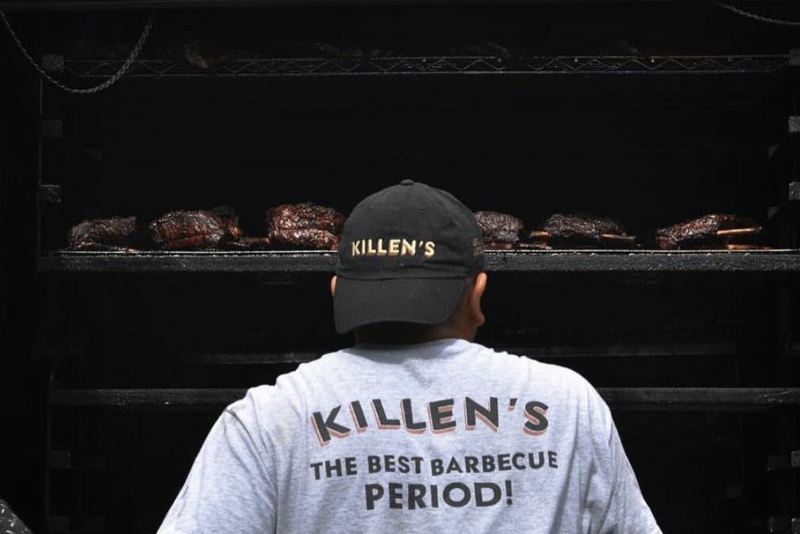 It isn’t on the menu all the time or even every weekend. Depending on what’s available and fresh, it could be lamb one weekend, or a pig halved and roasted, but prepared differently, with the bones left in. 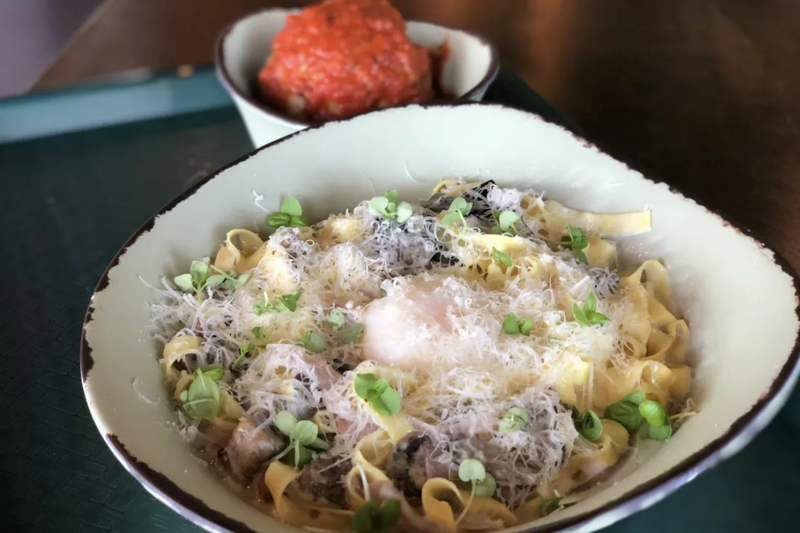 If we weren’t holding out for the suckling pig, we could have treated ourselves on a variety of house-made pastas, delicious risotto with forest mushrooms or some of the best grilled octopus in the city. Back in the kitchen, the butcher has finished de-boning the pig. He coats the inside flesh with stone-ground mustard and an herb blend made with garlic and thyme. Sage leaves are spread throughout after which 10 or so whole garlic cloves are inserted into the meat in small slits made throughout the body. 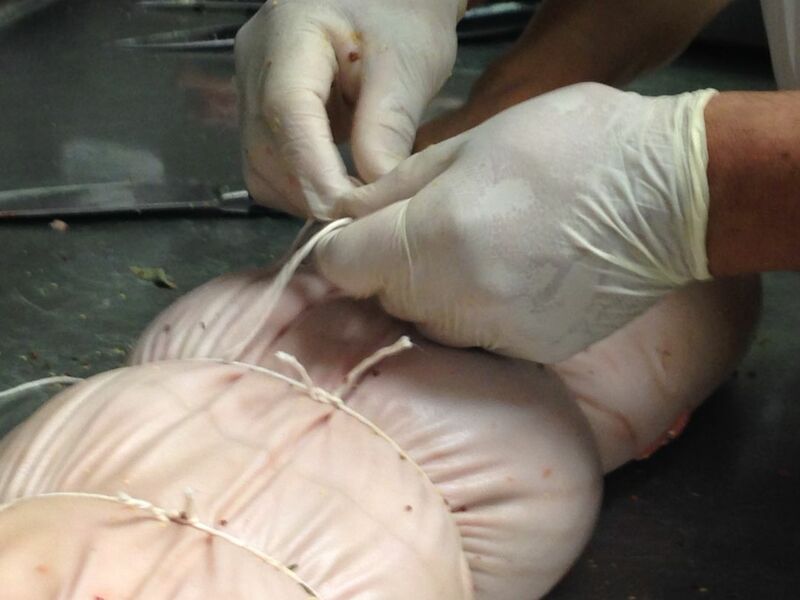 Pork tenderloins are inserted to replace the rib cage and are either added to or taken away from the cavity to ensure the proper shape of the porchetta when sitting belly-down. When he is satisfied with the look, Antonio ties up the pig in kitchen twine and places a lemon in its mouth. One last coat of flavor “shine” consisting of a paprika and thyme glaze is applied before it is oven ready. Efisio has planted “groves” of Sardinian myrtle at his house, at various family members’ homes and even a few secret locations around Houston. These myrtle branches are the key to the distinct Sardinian flavor. Wrapping the pig in myrtle branches and sitting atop a bed of rock salt, whole heads of garlic are placed alongside the pig and at midnight, before Efisio leaves for the night, the pig goes in to the oven as the oven is turned off. 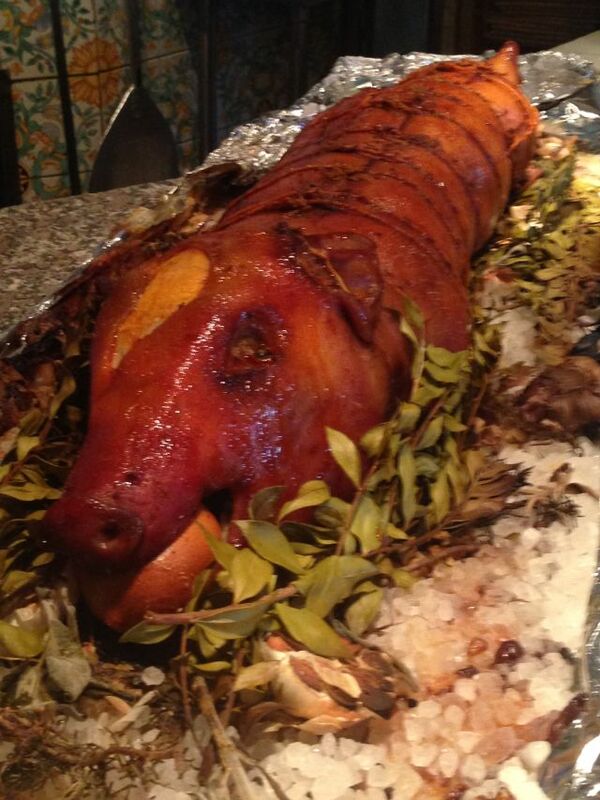 For the next 9 hours, the pig is slowly roasted from the oven’s remaining heat. The next morning, the porchetta is removed and set to rest, letting the juices distribute throughout. When ready, the pig is presented in the main dining room much to the delight of curious (and hungry) gawkers. 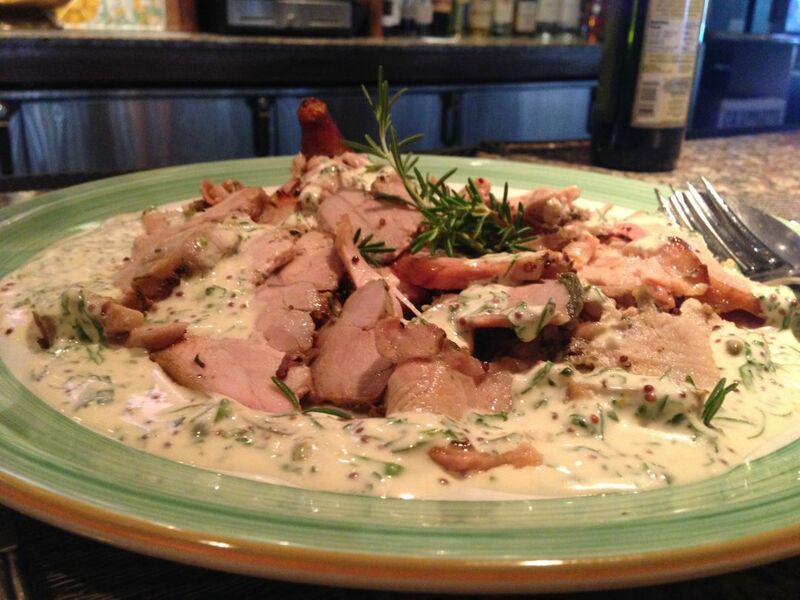 Upon ordering, the pork is thinly sliced and served on a communal platter with a creamy yet surprisingly light rosemary parsley sauce. The meat is moist and tender while the mustard and perfume of myrtle stand out spectacularly. The skin is bronzed perfectly to a slight crisp. We’ve never been to Sardinia, but we suddenly imagine ourselves there, surrounded by beautiful beachside cliffs, wine and the sweet smell of myrtle in the air. Served with a choice of salad or roasted vegetables, the finished product was entirely worth the wait and we’re already wondering what next weekend’s special holds.